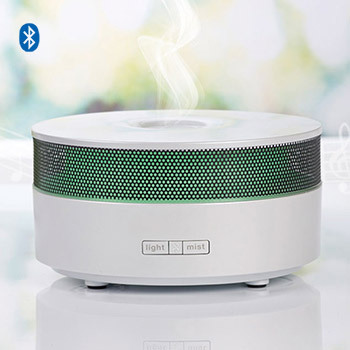 A humidifier & ioniser in one with inbuilt, Bluetooth speakers! A contemporary & stylish Aroma Diffuser acting as a humidifier and ionizer all in one! The Amora Harmonia is no general aroma diffuser. It's the jewel of aroma diffusers which overflows with class, style and modernity. Using scented candles may be a favourite thing in your house but it’s time to banish them from your home because of the unsafe poisons they deliver into the air which can add to current wellbeing issues or even cause new conditions. The Aromatherapy diffuser will fill your home with beautiful fragrances of your most loved essential oils without dirtying the air in your home. The inventive Amora Harmonia is an all in one humidifier and ioniser which disperses a tender stream of vapour in to your air and creates ionisation of the air therefore enhancing its quality. The Amora Harmonia turns distilled water into a fine mist acting as a humidifier and ioniser. Adding just a few drops of your favourite essential oil into the water it becomes a blissful and indulgent aroma diffuser, providing the tranquil, safe and beautifully scented atmosphere you desire in your home. The Amora Harmonia gives your senses an awakening through three means; chromotherapy, aromatherapy and sound! This is also often referred to as colour therapy, colourology or cromatherapy and it’s an alternative medicine known to have positive effects on your mind. Light is used in the form of colour to balance a person’s energy, be it emotional, physical, mental or spiritual. Colour therapy can be very soothing and can create an ambient and relaxing atmosphere in your home. Aromatherapy has the purpose of altering your mood and psychological wellbeing through natural and blissful essential oils. You can utilise your favourite oils to combat stress, tiredness and mental strains depending on what your problems are. Having the essence of your favourite essential oils pumped through the air will allow you to relax after a long day. The Amora Apollo boasts inbuilt speakers enabling you to play some of your favourite music, be it a relaxation tune to wind down with or your favourite band or dinner music to impress your guests. You can play music via Bluetooth from your phone or tablet or any other Bluetooth compatible device. Chromotherapy, aromatherapy and music are all expertly combined in the Amora Harmonia to give you a home experience which is second to none. What are you waiting for? Treat yourself to the Amora Harmonia today! You won’t regret it! Your aroma diffuser is only as good as the essential oils you put in it. 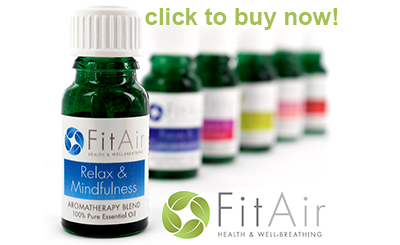 That's why we recommend FitAir Aromatherapy Blends. These 6 unique blends of pure essential oils come in a scents to suit every mood. Choose from 'Inspire & Invigorate', 'Strength & Harmony', 'Energise & Revitalise', 'Sensual & Arousing', 'Relax & Mindfulness' or 'Focus & Concentration' - or why not treat yourself to the whole set? The FitAir Aromatherapy Oils with Carved Wood Storage Box makes an amazing gift for the aromatherapy lover in your life.